Bruce Wayne / Batman:"I'm Batman!" Bruce Wayne / Batman:Bats are nocturnal!" Alfred Pennyworth:"Bats might be, but even for billionaire playboys, three o'clock is pushing it." Lucius Fox:"So what's your interest in it, Mr. Wayne?" Bruce Wayne / Batman:"I want to borrow it. For uh, spelunking." Bruce Wayne / Batman:"Yeah, you know, cave diving." 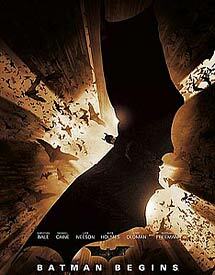 Lucius Fox:"You expecting to run into much gunfire in these caves?" Henri Ducard:"Are you so desperate to fight criminals that you lock yourself in to take them on one at a time?" Bruce Wayne / Batman:"Actually, uh, there were seven of them." Henri Ducard:"I counted six, Mr. Wayne." Earle:"Bruce? You're supposed to be dead." Bruce Wayne / Batman:"Sorry to disappoint." Bruce Wayne / Batman:"You have me declared dead?" Alfred Pennyworth:"Actually it was Mr. Earle, he's taking the company public. He wanted to liquidate your majority shareholding. Those shares are worth quite a bit of money." Bruce Wayne / Batman:"Well it's a good thing I left everything to you then." Alfred Pennyworth:"Quite so, sir. And you can borrow the Rolls if you like. Just bring it back with a full tank." Rachel Dawes:"It's not who you are underneath. It's what you do that defines you." Lucius Fox:"You have been hanging out in the wrong clubs Mister Wayne." Alfred Pennyworth:"I called Mister Fox when your condition worsened after the first day." Lucius Fox:"I analyzed your blood, isolating the receptor compounds and the protein based catalyst." Bruce Wayne / Batman:"Am I meant to understand any of that?" Lucius Fox:"Not at all, I just wanted you to know how hard it was." Rachel Dawes:"This is the third of Carmine Falcone's thugs you've had declared insane and moved into your asylum." Dr. Jonathan Crane:"Well, the work offered by organized crime must have an attraction to the insane." Alfred Pennyworth:"You look very fashionable, apart from the mud." Alfred Pennyworth:"If those are to be the first of many injuries to come, it will be wise to find a suitable excuse. Polo, for instance." Bruce Wayne / Batman:"I'm not learning polo, Alfred." Alfred Pennyworth:"I assume that as you're taking on the underworld, this symbol is a persona to protect those you care about from reprisals." Bruce Wayne / Batman:"You're thinking about Rachel?" Alfred Pennyworth:"Actually, sir, I was thinking about myself." Alfred Pennyworth:"What was the point of all those push-ups if you can't even lift a bloody log?!" Henri Ducard:"Your compassion is a weakness your enemies will not share." Bruce Wayne / Batman:"That's why it's so important." Flass:"What are you waiting for?" Policeman:"The Batman's in there. SWAT's on the way, but if you want to go in now, I'll be right behind you sir." Jim Gordon:"I never said thank you." Bruce Wayne / Batman:"And you'll never have to." Jim Gordon:"I gotta get me one of those!" Henri Ducard:"Criminals thrive on the indulgence of society's understanding."